Stitchers Anon: Absence and last chance! This will be my last post for a week or so. On Monday I go into hospital for surgery on the Tuesday. So, I had better share the last of my news whilst I can. Firstly: people are not collecting their prizes which is making life a little difficult for me. If you donated to my fundraiser but have not had your number drawn, then can you please email me with a choice of prize. First come first served..in fact you had better put your top two and I will try my best not to muck it up. Anyone who misses out on a prize can chose a pdf chart from my website..in fact if you would prefer a pdf chart, just email me with your choice of chart. That way everyone gets something! Secondly...and I am so excited with this news. But let me remind you of the background. I sent of for a single thread from sew and so. One thread, which was sent in a normal letter envelope. Can you guess how much the postage was? £ 5.00 stirling. Yes, I kid you not. I emailed them to query it but didn't get a reply. So I applied to become a DMC stockist here in the heart of Ireland. And so I will be buying threads at cost as a licensed DMC stockist...with me so far? I researched far and wide, and begger me but someone is actually selling them CHEAPER than DMC provide them! I have no idea how they are doing it BUT someone suggested I get them from the USA where they are cheaper yet again. But to do that and still be cheaper, I would have to lie and hope VAT and Customs don't catch me. Hmmmm...Customs and Duty. Do I want to risk that? No I don't! Another person suggested I buy the cones and do my own....hmmm well yes, I could but for two things. First, it goes against DMC's terms and conditions. Cones are not meant to be broken down for resale, and secondly....seriously? Who has that much life to waste? Not me that's for sure! So I have come up with an idea that I hope you will like! We are now taking sign-ups for the first Stitchers Anon Thread and Chart Club! * Access to a members only forum where freebie charts and special offers will be posted just for you! 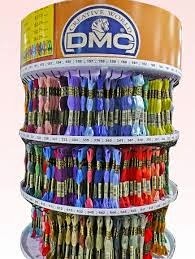 * At the end of each month, you will receive a batch of DMC stranded cotton threads and by the end of the year you will own the complete collection of DMC threads. The total price for this membership is £22.00 per month plus p&p. Payment is only what the post office charges and if you are over charged, you will be refunded via paypal. So for £264 you will receive 465 threads and 12 charts of your choice and freebies. Your first payment will be invoiced for through the Stitchers Anon website, on the T & C Club page and I will then send an invoice on the first of every month, with threads sent out at the end of each month. To sign up, contact me through my website and I will send you your first invoice! If you have any questions, please feel free to contact me via the website. This special club needs a minimum number of participants. Should we not get enough then any deposits will be returned. Proof of postage is always obtained. Hope you get better soon and good luck with the club. You'll be in my thoughts and prayers. Take care of yourself and don't worry about anything to do with us. You have to be #1 right now! I hope everything goes well this next week and you get out of there quickly. Sending lots of love and healing thoughts your way. Take care sweetie. What a fun idea, although i already have the full set of DMC. Got mine a few years back from the USA when sites had mega sales. Ladies are going to love this idea. Best wishes for your surgery next week, hope all goes well and you are soon home recovering. Take care of yourself. That's the first priority! A candle is being lit for you! I hope that all went well in hospital and I want to thank you for my great prize - I love the little kit you sent me, it is so cute.